Since getting back from northern Indiana Monday night, I’ve been thinking about ways to share my trip with you. I usually return from these Amish journeys with a jumble of thoughts and photos…some of them become posts and some just sort of evaporate. In the interest of capturing as much of that as possible, I thought I’d just share a bunch of photos I took, with a little narration to go along with each. These photos are from the Elkhart-Lagrange community, unless otherwise noted. So consider this a guided tour of what I did last week, with me jumping around a bit between days and communities as I give you a little stream of consciousness on what’s going on in the photos. Here we go. First we’re going to look at some phone shanties. This one looks a little unsteady. Or maybe just taking it easy. As does this one. Or this may just be the angle I’m shooting. The Lagrange settlement seems to have a lot of phone shanties, small buildings containing a phone, separated from the home or business. Some are shared and some are single-family. The idea is to have phone access nearby, but not inside or too close to the home. The structure houses a telephone, a stool, a phone book, and there are probably some notes and numbers scribbled here and there inside. Actually some of these get to be pretty big, maybe there is more in there than I’m aware of. In comparison I think in much of Lancaster County the phone has moved closer to the home and into businesses and buildings. You don’t see so many phone shanties there, though they are supposed to be more common in the more traditional southern end of the community. 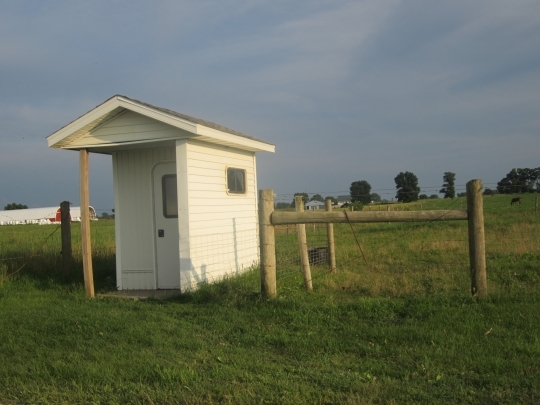 I have wondered for a while now if Amish will ever install computer shanties with regulated internet access, away from the home and shared between a number of families or Amish businesses. It seems it would provide a limited measure of access for businesses, but take it (safely?) away from the home. Could it happen one day? This one was occupied, at least that’s what the fully-loaded bike parked outside tells us. You’re seeing bikes in the background because this photo was taken outside of Hawpatch Bicycle. 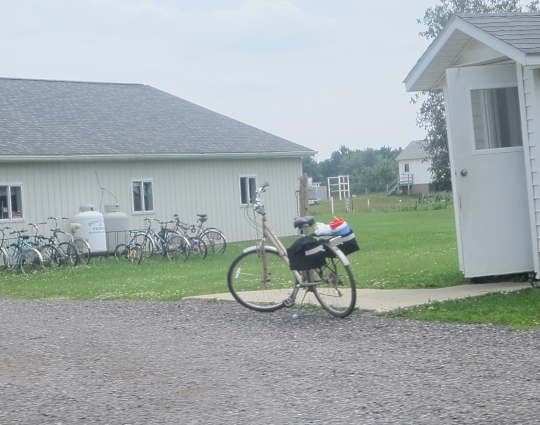 Biking is accepted and ever-popular in this community. It’s a way that men travel to factories and families enjoy recreation on warm summer evenings. You see some pretty nice bikes in this settlement. Walking through the town of Topeka on Saturday morning, they were parked everywhere as Amish folks went about their business. One more phone shot, with some solar panels on the roof of the garage. Solar panels continue to propagate throughout Amish communities, with a lot of them in northern Indiana in the Elkhart-Lagrange, Nappanee, and Allen County communities. And when I was in Ohio last Sunday I noticed that Ivan Miller had them attached halfway up his windmill. Sort of ruins the windmill aesthetic, but the spot was a good one for catching rays. I visited quite a few Amish-owned businesses while in the area, including Lehman Enterprises, Kountry Wood, Pathway Bookstore, Miller Engine Repair, and Quality Hardwood Sales. 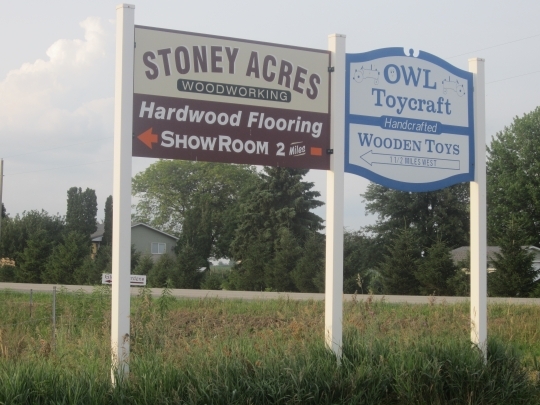 These signs are on a side road off of Highway 5, the north-south route that takes you down from Shipshewana, near Topeka and then on towards Ligonier. I remember dropping in on the OWL Toycraft place when I was selling books here in 2006. I can’t remember for sure whether he bought books or not, I don’t think he did. Neat shop though. Here is the front of Pathway Bookstore. I arrived to a completely empty shop, and had to fetch someone from the home, the first house south of the shop, as it was lunch hour. That’s what the sign left on the counter told me to do. She was just finishing up and about to head over when I knocked on the door. I got a book on Amish schoolteachers in Mexico. Pathway Publishing, who produce Family Life and quite a few other things, is based in Aylmer, Ontario. Lagrange County has been home to their stateside presence for, well, a pretty long time I think (am sprawled out on the floor and too comfortable to look up dates tonight, sorry folks 🙂 ). Sticking with the business theme for a moment more, on Friday I took a little drive from Nappanee to the small community at Rochester, about an hour south. This business, unfortunately, was closed when I arrive. Looks like an elephant sat on that can of beans there. 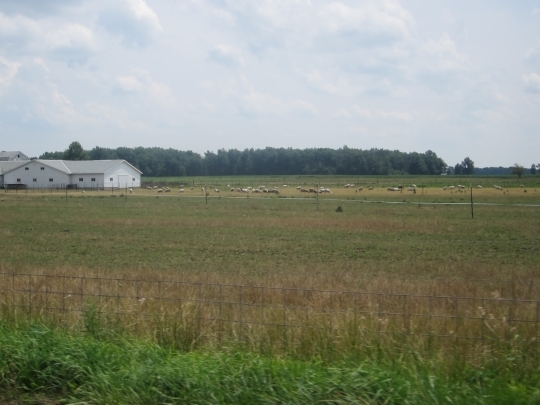 I only saw a couple of Amish homes in the Rochester settlement, but I believe I passed through an Old Order Mennonite community about halfway between Nappanee and Rochester. There was a buggy parked outside the home, but the mailbox said “Martin”. Lagrange settlement again. On the other side of this fence is a baseball field. Pretty handy ladder if a ball gets away. You see them on fences near schools, though this one belonged to what looked to be a ball field unattached to a school, just carved out of someone’s farmland. Pretty big for an Amish school. Not a bad playground either. Lot of nice views across fields like in this photo, and the next. The terrain in the Lagrange community is generally pretty flat, though there are hilly pockets throughout the settlement. This may have come out the best of all the photos I took. You’ll see these signs here and there in the Lagrange settlement. I like the lettering. 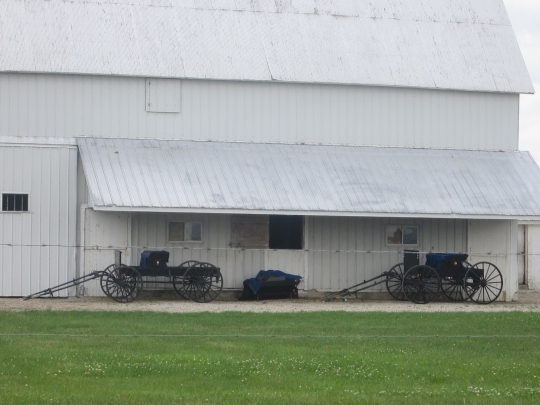 Let’s leave Lagrange-Elkhart behind for a brief look at the Swiss Amish community in Adams and Jay Counties. Homes are plainer here, as are the Amish in general. Since Swiss buggies are uncovered, you need to watch where you park them, especially if grey skies threaten. 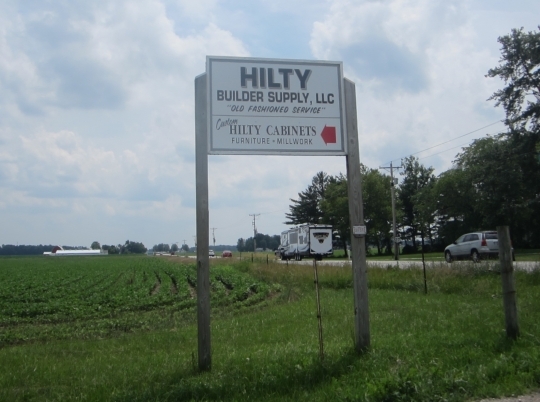 Hilty Builder Supply and Hilty Cabinets. “‘Hilty” is a fairly common last name among the Adams County Swiss. What’s that I see below the sign? Sheep being sheepish in an Adams County field. Back to Lagrange. 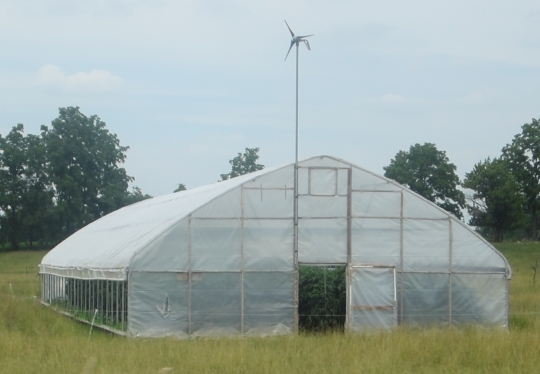 This small greenhouse is full of tomato plants I believe. If it needs to, it can turn that rotor horizontal and take off (a little-known Amish invention). Okay maybe my imagination is getting ahead of me. I took this photo waiting at a stop north of Shipshewana. Looks like there might be a picnic in the back there. Another Amish vehicle heading down the road. I didn’t take any night shots, but I think the Amish in Elkhart-Lagrange have some of the most interesting and attention-getting lights. They have, among other things, the blinking SMV triangle. Also, and I’m pretty sure this was a youth buggy, an unbroken strip of white and red lights going around the top of the buggy. In other words these are the polar opposite of Swartzentruber carriages, at least as far as Amish vehicles go. 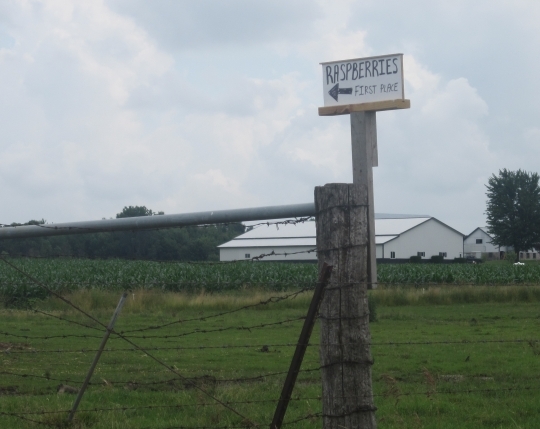 I mentioned the owner of this burgeoning fruit business in my last post on Amish and RV factories. He works in one but assembles wooden clock faces and grows raspberries on the side. And here they are. He said they were very good this year, but that they may be a little soft and to keep an eye out for worms. 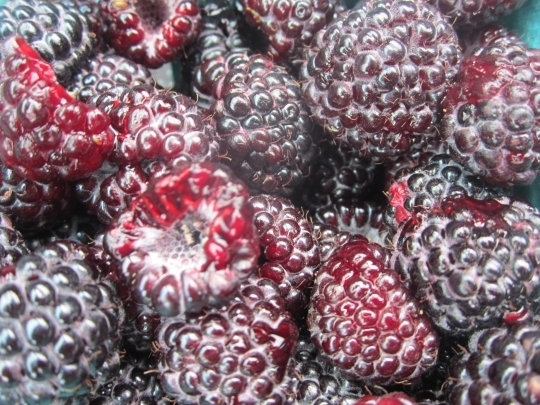 I did, and they were good (the berries, not the worms–did not taste any of those). They are not certified organic, but he said something about not using chemicals. He was pretty enthused about it all. Not everyone works in factories in northern Indiana. Not all the time, at least. Whenever I drive through the town of Lagrange, I look to see how many Amish buggies are lined up outside of Pizza Hut. Doesn’t look like there was much room on the hitching pole Saturday night. These folks were just pulling out. A church wagon poking out from behind a building. I attended church Sunday in the Topeka area. It was a very nice morning, the first time I had attended Amish church in Indiana. When singing had finished, the bishop got up in front of the congregation and read out a few letters describing some of the financial needs for medical cases in the community. Rare blood disorder, open-heart surgery, and diabetes were among the ailments he listed. Most of it was in Pennsylvania Dutch, but I did catch some of the figures, at least one of which I am pretty sure exceeded $100,000. When there is a need, depending on its size, neighboring districts may be asked to help. And if there is a very high bill (some can approach and even surpass $1 million), a call will go out to other communities as well. Amish get pretty good rates by making cash payments to hospitals within 30 days. On a related note, there is a new clinic opening later this year in Topeka, along similar lines as the Clinic for Special Children in Strasburg, Pennsylvania. We’ll have some more on that as the date approaches. Also, at church one young couple was “published” (the Amish term for formally announcing an upcoming wedding). They are to be married in about six weeks. I wonder how they’ll spend the time til then. Sunset is a good time to take photos. In this area the sun does not descend until quite late, being on the western edge of the Eastern time zone. There were still traces of light in the sky until near 10 pm and maybe a bit beyond that. How did you find this visit? Well, it’s not quite like going there yourself, but I hope you enjoyed this little photographic journey. 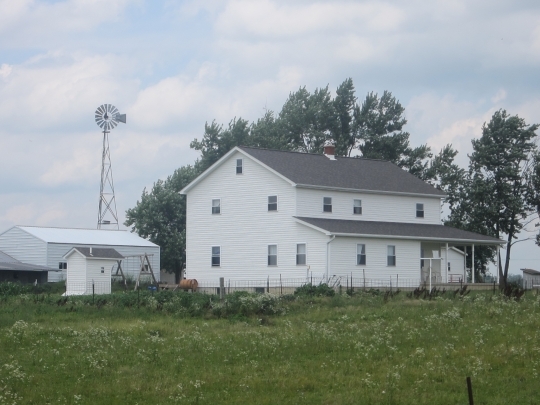 is an Old Order Mennonite community (Groffdale Conference — horse and buggy Mennonites) near Tippecanoe and that may have been the one you passed through. 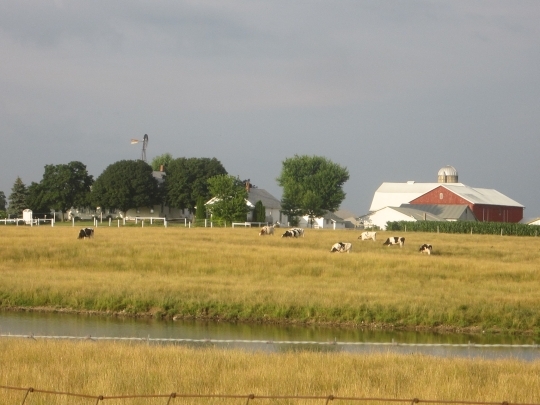 I’ve never been to the Rochester Amish settlement — will have to take a side trip there next time I travel north. 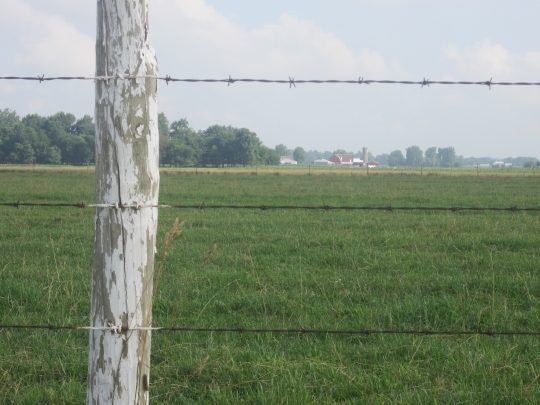 And a question– do you happen to know how many square miles the Elkhart-Lagrange settlement covers now? Good question Al, I do not know. There is a relatively recent directory, 2012 I believe. I think it has reached down to touch the Nappanee settlement. When I was there in 2006 it was already stretching up to touch Michigan as well. There are areas when driving through this community that you don’t see English homes for quite a stretch. Sounds like that may have been the community you are talking about. I think it was a little south of Mentone. On the way back to Lagrange, I drove through a hamlet called “Disko”. I could look at maps for hours just to read the place names. Hi Erik, hope all is well with you. The photos are great and make me miss Indiana. Have you ever visited any of the communities in the southern part of the state? Most of them appear to be fairly strict old order Amish. 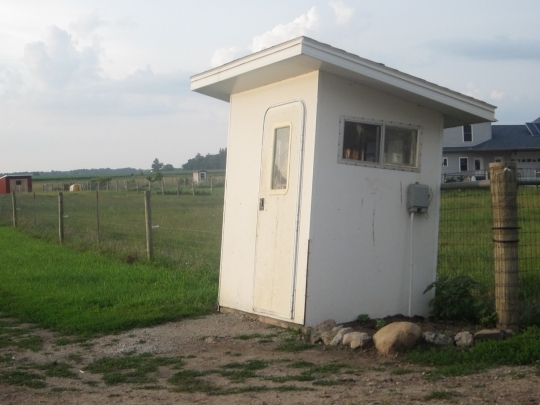 When I was there a few years ago I didn’t take my camera when visiting my Amish pen-friend as I didn’t want to offend her or her family. I regret that now as I could have taken photos of the house and farm and all the goats and horses and buggies. Helen I spent 3 weeks in Daviess County, and in another settlement that is now no longer Amish, but never visited communities in some of the more conservative areas of southern Indiana like Orange County. I thought I might on this trip, but had to back burner that. How did you get an Amish pen-friend? It looks like and sounds like you had a terrific visit. I think my favorite picture is the cloudy sky picture. I’ve been seeing clouds like those at evening time when I’m at work this week. The one buggy picture also looks like they are off to a picnic to me too. I couldn’t see anything odd in the “Hilty” picture, but I wondered if the Lancaster Gorilla had followed you to Indiana. Not odd-I think Erik was referring to the RV under the sign. The Amish probably had a hand in assembling that. That’s right Denise. I had RVs on the mind earlier in the week. I didn’t notice one was driving right by when I took this, until I pulled it out for this post. Perhaps the dealership pays an employee to drive the RV around so that they can have picture snapping English take promotional pictures without being against any Ordnug rule (there is no rule against free advertizing is there). 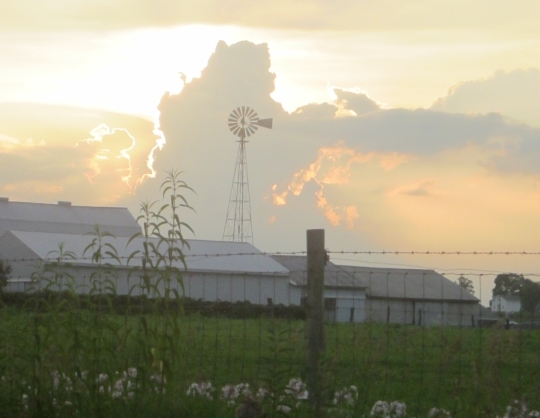 THANKS ERIK for sharing photos — I just love this part of the country! Being from Florida, it’s always a treat to see those beautiful farms! We will be in Penn. and Indiana, early Sept., visiting relatives and friends and can’t wait to “take in” all of the magnificent scenery! Our friends live in Southern Indiana, and they too have a few Amish families, around Mitchell, IN. — they even “deal” with them, in their Antique shop, with an Amish carpenter making crafts for their shop, too. On getting pics of Amish and area — 2 years ago when we were in Lancaster, PA and surrounding areas, we shot a lot of photos, through the car windows, always managing to get any Amish people at a distance, without snapping them “face-on” — we did respect their privacy in this matter, and we got plenty of good photos, without intruding on them. Thank you so much for sharing these wonderful pictures! Eric, I always enjoy the photos you include. This was a great batch. These sort of photos also make nice computer wallpaper. Thanks Randy. If you’d like the larger wallpaper size version of a specific photo just drop me an email. Love the photos – thanks! The Elkhart-LaGrange area is my home territory, and the pictures were almost like a visit. Thank you! Thanks Jan, that’s what I was hoping it would feel like. This was a fun post to put together. What fab pictures, just loved looking at them and reading about where you have been, me thinks you could have one of the best jobs !! What away to spend three weeks, very nice lol, think my favourite pic is the buggys all lined up for pizza hut :-). Thanks Andrea, it wasn’t 3 weeks in Indiana, but with this and two trips to PA since beginning of June it’s been about that long in Amish communities. Yes I am grateful for it. That Pizza Hut is popular with the Amish. 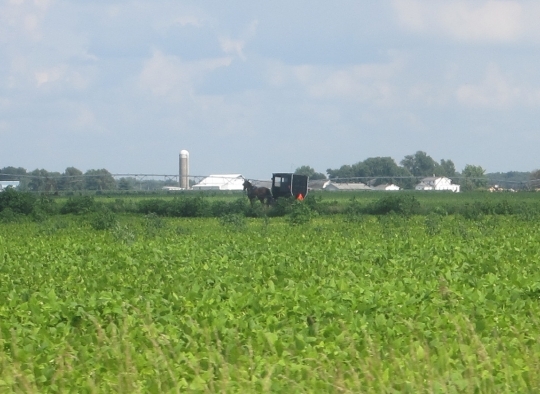 I drove by again on Sunday when leaving for Ohio, and not a buggy was to be seen, of course. Also love the sunset picture. Very peaceful. We go to Shipshewana every fall.Love it there. Have been wondering about the Allen/Adams county areas. Do they have stores and such as Shipshewana does. Any tourism? They have a handful, but neither community is really oriented to tourists. That may be slowly changing…at two of the stores I stopped at in Adams County, I was given a brochure with a map of Amish businesses and profiles of a number of those businesses. 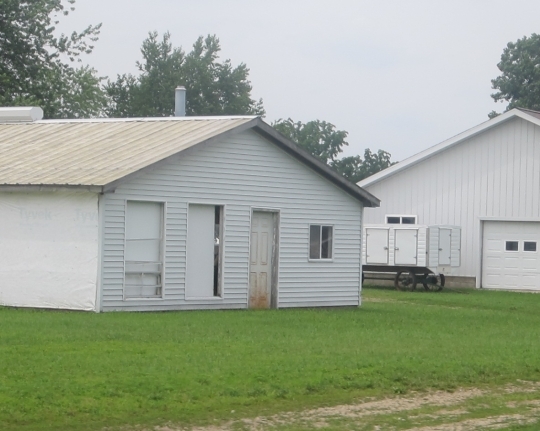 In Allen County there have been moves to develop a tourist complex in Grabill, with Amish involvement. Thanks for the wonderful photos and description. I enjoy learning about the Amish life, society and recipes. I drive a semi truck around the country and enjoy seeing the different areas they reside in. 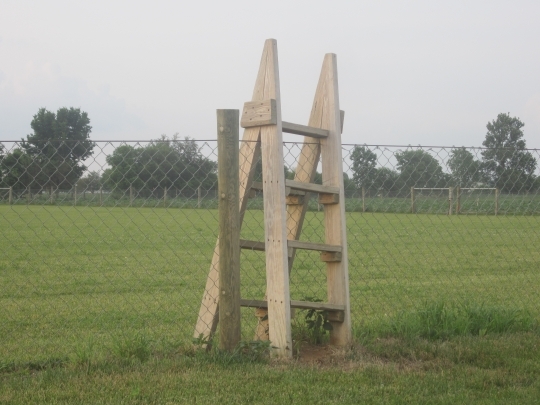 In Northampton County Pennsylvania where I grew up, a ladder over the fence or an opening in a stone fence large enough for someone to squeeze through is called a ‘Fensahgreich.’ I’m curious to know if there are different words for it elsewhere. I notice so often that they have smaller windows in their homes. I wonder why they would not go bigger as it would let in more light and since they don’t have a lot of furniture that they need lots of wall space would they not get larger windows to let the sun in for heat and light in to save more on their lanterns, Just wondered. Well … maybe it is because unless they used insulated (thermal) windows they would also be letting a lot of cold winter-time air in, too. Our home is almost 100 years old and the difference between being in a room that has the original windows and one that is in the part of the house that was remodel 28 years ago & had Andersen thermal windows installed is amazing. I have insulated that old house as much as is possible, and sealed and caulked everywhere that I can … but those old double hung windows let in a more cold air in the winter and probably let OUT more cool air in the summer than I care to think about. Bigger windows would mean more surface area for heat exchange and more gaps along the edge to let air escape. That would be my guess anyway; as to why they wouldn’t have already done what you are suggesting. It’s a good question on windows, that varies, it may be part of the standards in some groups as well. One Amish place I stayed at recently is full of windows, and happens to be in the right spot on the hill that it catches a breeze all the time. I think they knew what they were doing when they built it. Of course it also gets winter winds though. I’m not totally sure if it was an Old Order Amish place when it was built though, or something close to that. The pictures and their explanation were a great way to report on your trip. It makes me feel like I was there for a little while. You are very blessed to have been able to make this trip. My husband & I plan to go to Ohio in the fall. This post makes me want to go to Indiana also. Well, I enjoyed your trip immensely! I also believe that it’s just a matter of time before limited-use internet is permitted for Amish home businesses and for ordering purposes. Great blog entry and photo’s Erik. Do you get a sense that the Amish community is less, static, or more absorbed into English culture compared to 5, or 10 years ago? You can answer by region or qualify if you like. Dave that is a hard question to do justice to here, but my first response is to say more, with Amish involvement in businesses and with the general creep of technology in both English and Amish society. However Amish have also migrated a lot in the past decade, and those are often more traditional groups trying to stay that way, and also they tend to have somewhat larger families as well. Beautiful photos! As others stated, I really enjoyed the virtual tour. My favorite was the last one. Absolutey gorgeous! I’ve only visited Amish communities in the midwest and would love the opportunity to visit other states. I also liked the thundercloud scene the most — just beautiful! Love all these photo’s. Thanks for sharing them with us. They have probably been to a food locker or the store and picked up food that needs to be kept cold. The last time I was in Ethridge, Tn. I noticed a lot of buggies coming from the business area had coolers in them, and assumed that was what they were for. Really enjoyed all the info and pictures. I live near Shipshe & Nappanee & visit often, but haven’t ventured toward Allen County. I look forward to future info on the Topeka clinic. 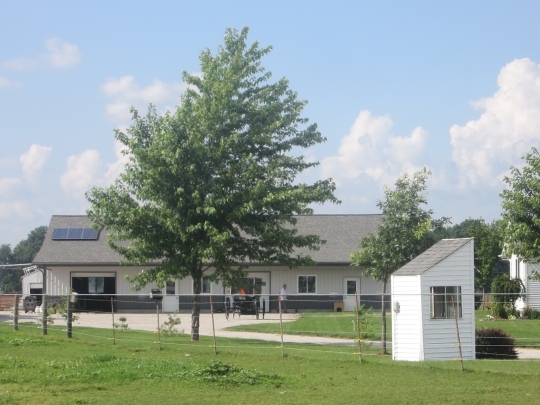 The CHC is a 501(c)(3) non-profit healthcare facility that provides excellent and affordable medical care consistent with the needs of the Amish, Mennonite, and other rural northeastern Indiana communities. The CHC will initially focus on serving children with special healthcare needs and their families. We embrace, incorporate, and promote participation in research to advance medical knowledge and improve care. Thanks for the clinic info, Erik! Appreciate it! Well done, Erik. 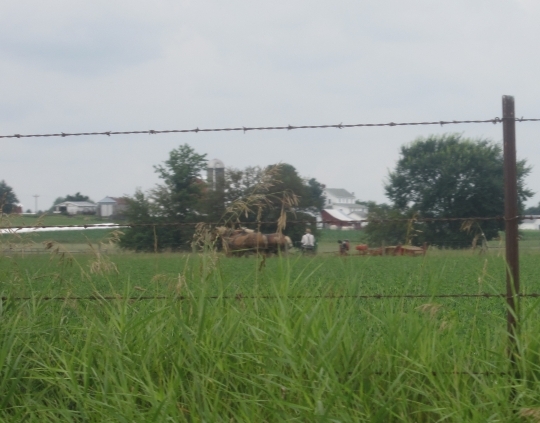 I spent a day in Middlebury in June seeing some Mennonite friends. The supper guests were sisters and their families, and the sisters’ the family that runs Pathway in LaGrange. 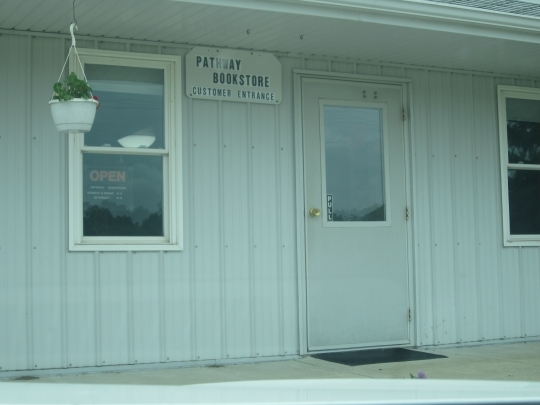 Like Al in KY, I have driven by the bookstore more than once without realizing it as well. According to his sign, the guy selling raspberries got “First Place”, so they must have been good! Haha! It was a young lady that helped me out at Pathway, maybe one of the sisters you mention. No, I’m not saying your photos were bad; they are outstanding. Just curious if many Amish go through the process of having their farm production “citified” as organic? Most of the people I know that have looked into it claim that it is more trouble than it is worth. Instead, they use terms like “All-natural”, “No chemicals” or “No antibiotics” for animals they produce or “No preservatives” for any food items they may produce. There are people that will insist on that certified organic label, but unfortunately not many want to pay the premium that it costs to purchase certified organic products. I am not knocking organic production; I prefer it when the price differential between organic and standard produced items is not too great. Apparently, though, demand for organically produced products has not materialized as much as we might have all expected that it would. Demand for “LOCALLY produced” items HAS truly taken off though & that fact is not lost on most of the Amish that truck farm. Yours is another good question which I can only touch on in terms of an answer–in 2006 when I surveyed this community it seemed like it was burgeoning “thing” in just a small minority of farmers, who were there already or in the 3-year process to get there. I would guess it is a bigger deal in Lancaster County. Lancaster Farm Fresh Co-Op had around 70 farmers last time I heard, most of them Amish. I think some Amish are seeing it as a way to do something with a relatively small tract of land. It might be that the math works out better in a place like Lancaster in terms of the costs of converting vs. the demand for organic produce with the huge mid-Atlantic region market. 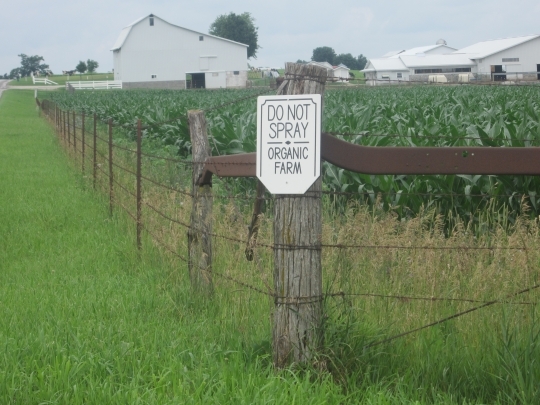 To the average Amish farmer, I am not sure how odd or unorthodox organic farming seems nowadays. More success stories probably help make it more attractive, assuming the successes outweigh the failures, which I would guess to be the case. Of course the locally produced bar is a lot lower to clear and Amish have no doubt benefited from this trend without having to change the way they do things. I should have said: “Just curious if many Amish go through the process of having their farm production “certified” as organic? Although “citified” might work as well! Organic produce is city produce? Great typo…and actually fits pretty well. A few years ago I attended a customer picnic for the Lancaster Farm Fresh Co-Op held on an Amishman’s farm in Lancaster County. A few dozen Washington DC participants in their CSA program attended along with the Amish farmers and their families. When worlds collide…I don’t mean that anything bad happened, it was a nice event, it was just two very different cultures meeting, brought together by citified organic fruits and veggies. 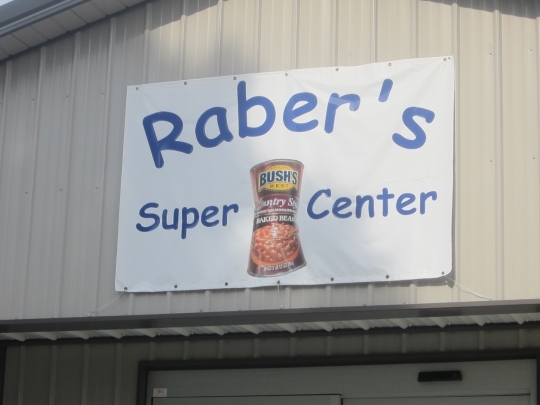 Does anyone else wish that Raber’s Super Center was a nationwide or international chain? I think I’d feel better about shopping there than other American super store chains that have come to Canada in the last 15-20 years (Wal-Mart, Target to name two). I think that Raber’s would probably succeed if they applied Amish values nationally or internationally even if the majority of the employees where English in their, lets say, Happy Valley, Newfoundland store location. I wonder if there are any Amish families in the tourist type areas that offer (for a fee) REAL AMISH HORSE & BUGGY RIDES to the tourists?? I believe it would be fun to try it at least once. 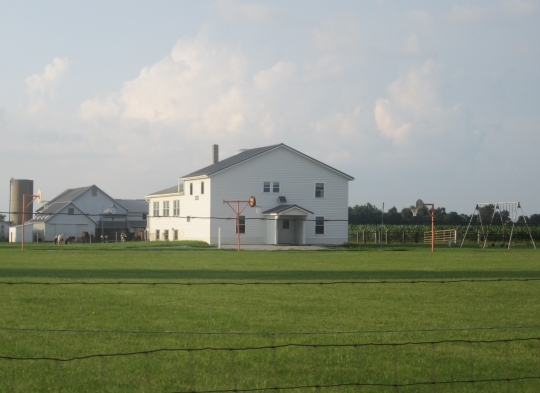 There is also “educational” attractions that tell about the Amish culture, in the real setting of a farm. Check out the travel info on the internet, for Lancaster, PA and you’ll find oodles of things to experience! Now you are making me want to go back — which we will be traveling up that way, in August!! Can’t wait! I have to smile about the REAL AMISH, sorry, it just tickles me. I am Amish and would LOVE to give you a free REAL RIDE. We gave the author, Wanda Brunstetter and her husband, Richard a ride around the square (4 Miles) a few weeks ago. I can answer the question Erik; of the couple that was published in church, which happens to be our district and Erik went to our church. They do lots of prep work and live separately, the bride moved to Ohio a year or two back, and her husband to be is from Ohio, so she will be here without her fiance for a few weeks, helping her parents get ready. The big district directory of 2012 is only this area and not from Nappanee and Michigan. The address directory covers all of that and more, it is the people who are covered in the Die Blatt. Some of us (society people) speculate about the use of internet by the Amish. Do you think that the internet will someday be allowed in the Amish home? I do hope we can keep it out of the phone shantys and such. People do go to libraries and use it there. My concern is the bad part of internet and all it can lead to. We can misuse internet as we can misuse other things in life, but when we nail it down, in all honesty, internet opens doors the Amish don’t need. So my answer is no. Erik, we enjoyed having you and that sandwich and fries was sure good at Emmatown. A Baja Burger. Thanks again! As did I, Mary Alice, I like that diner/restaurant, it is a neat atmosphere and interesting location. Thank you for your input, Mary. Someday I think it might be possible to have “personalized” browsers which give certain groups, like schools or even the Amish, very limited, pre-approved usage, and the ability to surf only chosen sites; no allowable links. There’s a little of that now, but it’s rather faulty yet. You could do your ordering, post notices/news to distant churches, and advertise your products. Society people could perhaps access your ads, but you (the protected group) could not venture outside the approved sites. Email sure would be handy too. Thanks for filling us in Mary Alice. I really enjoyed Emmatown lunch and church the next day 🙂 Say hello to “Mr. Yoder” from me! I went to see Wanda in Middlebury when she was here and she spoke of the time spent with her Amish friends. I’m with Lattice on the question of internet usage. I look forward to your response on that. Thank you for sharing. Living in Washington state doesn’t lend itself to seeing these wonderful sights in person. I hope to visit the Amish community areas in Montana at some time. Thank you Erik, for the beautiful photos, especially those of the Elkhart_Lagrange area. That is where I grew up, and I am planning on visiting my family there later this summer. 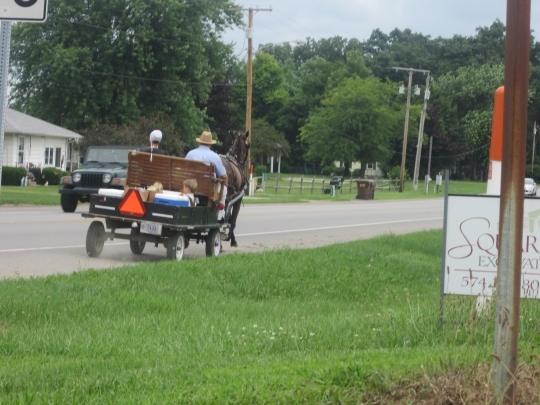 To the query about horse and buggy tours, there is a tour offered of the Shipshewana area. It basically takes you around the town. I so enjoyed looking at the pictures with explanations, which is always important. I was in that area in early August, and it was beautiful. We took a buggy ride in Shipshewana and loved it. unfortunately my camera messed up and I came away with just a few pictures instead of the hundreds I took. Tabby, glad you enjoyed it and sorry to hear about the camera snafu. That must be maddening. We’ll have a photo post up tomorrow in a similar style on my recent visit to the Pinecraft community in Florida. It was “low season” so not a lot of people around, but there were still plenty to visit with. Thank you for sharing your photos with us. And not just these, but all that you have posted over time. It’s not likely that I will ever be able to visit and see these things first hand, so I appreciate your photos very much. The Amish are special and wonderful people, possibly the luckiest of all of us here in America.